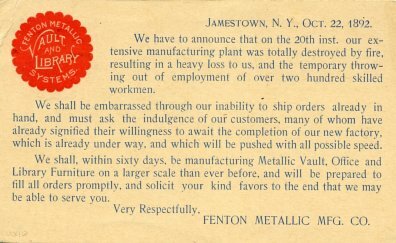 The Fenton Metallic Manufacturing Company of Jamestown, NY was one of the early manufacturers of steel stacks for libraries. On October 20, 1892 the company's plant in Jamestown was totally destroyed by fire. The company sent out the postal card above on October 22 to its customers and potential customers announcing the destruction of the plant and its intent to immediately rebuild. It did indeed rebuild and continued to provide steel stacks for libraries among its other metal products. 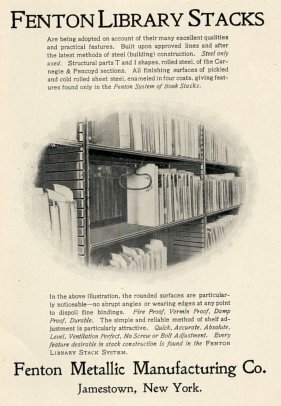 The ad for the company's stacks shown below was included in the publication announcing the American Library Association's conference for 1898 which took place at Lakewood-On-Chautaugua, NY near Jamestown. The company later became the Art Metal Company and continued to operate a plant in Jamestown until 1969.